As the nation prepares for the conduct of the 2015 general elections, the Bayelsa State Governor, Hon. Seriake Dickson on Sunday tasked the various religious bodies in the Country on the nation’s security and condemned the terrorist acts of the Islamic sect, Boko Haram, in the Northern part of the country. Speaking at the grand finale of a 3-day revival service with the theme; Go up higher, organized by the Deeper Life Ministry, which had in attendance its general superintendent, Pastor William Kumuyi, Dr. (Mrs.) Rachel Dickson, the Speaker of the State House of Assembly, Rt. Hon. Konbowei Benson, the Governor said the call became imperative in view of the recent killing of school children in Yobe State. Noting the contributions of the Church to the growth of the society, Hon. 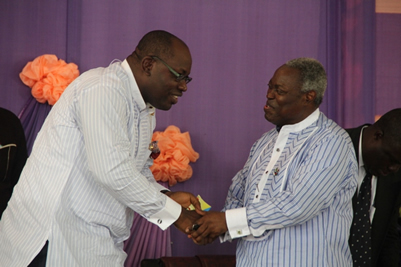 Dickson expressed the readiness of his administration to partner with the Ministry in making the revival service an annual event. This is just as he approved the construction of the Church camp link road in the Okutukutu area of the Yenagoa metropolis. The world, according to the Governor, is passing through troubling times in its history and the earnest prayer of the Church would go a long way in complementing efforts at curbing terrorism. “Our nation is going through very trying times. I know that you are always praying for us your children but I will like to, on behalf of our people and well-meaning Nigerians and the citizens of our World, urge you to pray for us because we live in a time where man has become man’s worst enemy. Attributing the prevailing peace and security in Bayelsa to effective cooperation between the Government, security agencies and the people of the State, Governor Dickson stressed the need for Christians not to rest on the oars as evil forces never relent in their sinister activities. He cautioned the youths to shun criminal activities such as kidnapping, armed robbery, cultism and other related vices, even as he called on leaders to strive at all times to positively affect the lives of those they lead. According to him, “here in Bayelsa, I can report to you that with the help of our brothers and sisters, this state has witnessed unprecedented peace and security in the past two years, since we came in. In his sermon titled; Go Up Higher, the General Superintendent of the Church, Pastor Kumuyi enjoined Christians not to wallow in self-pity but to continue to seek the presence of God and press forward in life. Making reference to biblical Jacob whom God asked to return to Bethel, which he described as a place of divine blessing and protection, Pastor Kumuyi, however, admonished believers to maintain their faith in the Lord to achieve breakthrough.